Email designers rely on images for more than just adding ornamentation to a campaign. Images often convey vital information and, more importantly, entice readers to engage with an email. Unfortunately, designers can’t count on images always being loaded. Many email clients (and users) disable images by default, bad connections can prevent images from loading, and visually impaired users can miss important information contained within images. How do email designers overcome this important problem? The good news is that HTML provides a reliable solution in the form of alt attributes. Sometimes called “ALT tags” or “ALT text”, they provide information about the content of images in the form of text when images are disabled or unable to properly load. Fortunately, they are easy to set up and even style to fit in with your email design. While you should be including the dimensions of your images as a best practice, explicitly declaring the width and height of your image gives your ALT text a container in which to live when images are disabled. In the absence of explicit dimensions, some email clients will collapse that area and the ALT text with it. While it’s not pretty, it does still provide some information about the content of the image. Even if users don’t enable images, they will still have some context for the rest of the message. Since this is still email we’re talking about, support for ALT text varies across email clients. 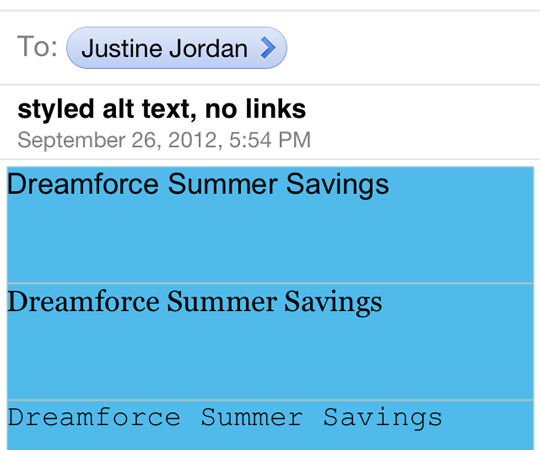 Using Salesforce’s impressive Dreamforce email, we can see how ALT text renders in a number of email clients. You can see in the table below that webmail clients generally have very good support for ALT text. Firefox, as well as modern browsers like Chrome and Safari, handle styled ALT text beautifully. While Internet Explorer doesn’t fare as well, your message is still readable. * Outlook adds a security message to ALT text. More details below. While Apple Mail and Thunderbird don’t block images by default, you can choose to do so in the preferences for each application. 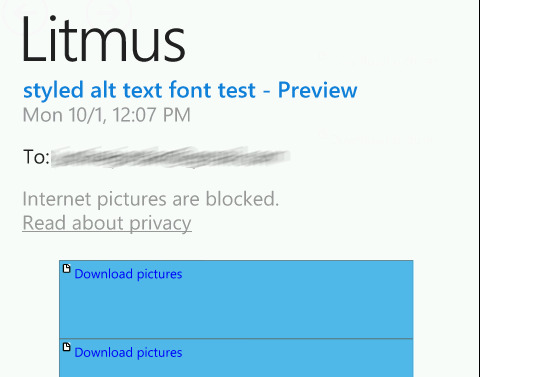 I manually enabled image blocking on these clients to see if they supported styled ALT text. Unfortunately, this makes ALT text in these email clients near useless as it only appears at the very end of Outlook’s security warning. Mobile clients have strong support for styled ALT text, which is great news—especially for marketers with heavy Android audiences. Like Apple Mail and Thunderbird, I manually updated my iOS settings to block images in order to observe how this mobile OS handles ALT text. 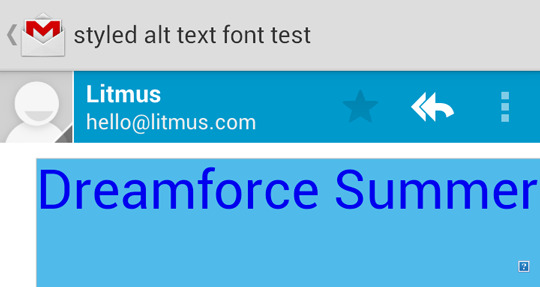 Styled ALT text appears identically in the email and Gmail apps in Android. Designers will be happy to know that most styles are supported in most clients. 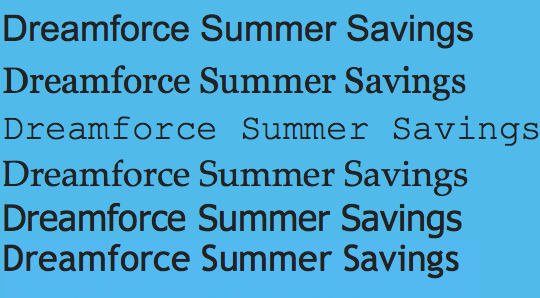 You can readily style your ALT text using things like font-family, font-size, font-weight, font-style, and color. Don’t feel like you are locked into using a client’s default typeface, either. Testing reveals that Arial, Georgia, Courier New, Palatino Linotype, Trebuchet MS, and Tahoma all work well in the clients tested above. Finally, you shouldn’t let this article limit what you do with ALT text. Feel free to experiment with things like text-shadow, background-color, and even web fonts to see what works for your email design and audience. In many email clients, ALT text will disappear once the size or length of the text exceeds the width and/or height of the image container. Due to this behavior, it’s probably best to stick to shorter descriptions and smaller font sizes to avoid having your ALT text removed altogether. Why do the image sizes end in a question mark? I.e. width="400? height="149?